Posted on	Sunday March 7, 2010 in Gourmet. You know when you get a food-related craving, you cannot stop thinking/obsessing about it until you have sliced it and consumed it whole? Last week, it was all about Churros. 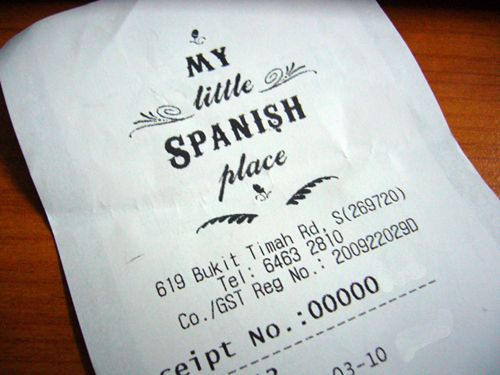 For that, we decided to seek out a spanish eatery. A quick search brought us to My Little Spanish Place. Before I move on, you probably should know that the picture of the receipt is the only image I have for this food review1. Nonsense, I know. Nestled in the prime residential district, the restaurant breathes of homely charm on the outside. As for the interior, if you ask me, it is tad overly made-up. The compact space seats about 35-40 covers. Some of the patrons were seated dangerously close to another table and some cannot move out of their seats unless 10 others move too. Speaking of seats, I like my chairs deep with arm rests. Unfortunately, the reserved table came with seats that aren’t. Once we had established that they do serve Churros, we proceeded with the meal order. The same waiter proactively alerted that paellas will take approximately 45 minutes to prepare. Simply put – order some tapas and wait or fill up on appetizers alone. Of course, we chose the glutton way. Tapas – Serving of bread came with olive and paprika spread. Tasty but not warm enough. Suspect it is the way it is served. Croquestas are creamy and rich. The mysterious filling is something we rather not know about. Albondigas have a good moist blend of lean and fat. Oh dear me! Good temperature too. Drinks – San Miguel and Red Wine Sangria are pretty normal. Nothing exceptional. Paella Mixta – It probably did take 45 minutes but we did not keep track. When it did arrive, the surprised look on our faces must be priceless. It was not moist. It was not bubbling with the warm spanish spirit. It was regular dry baked rice in a pan, topped with 4 pieces of overcooked prawns. We finished it still. It was decent for a rice dish. Desserts – Another disappointment. Churros were very hard; sprinkled with non-existent cinnamon and granular sugar instead of powered. Chocolate sauce earned some brownie points but not enough to redeem the reputation of the chef who butchered this traditional snack. PX with ice cream should only be ventured if you like really sweet ice cream. In all, it was a pleasant dinner spent in a pretty restaurant. It was bustling with customers and the mood was pretty nice. If you do want to visit, make a reservation and be ready to wait during service. I will only go back for a simple drink and hot snacks. Oh in all, we spent SGD101.75 inclusive. Sidetrack. Do not watch F Word Season 5 if you have very little self restraint. Now we lust for Greek.